Hi Whitehawkers! I found another photo from the the old school days. 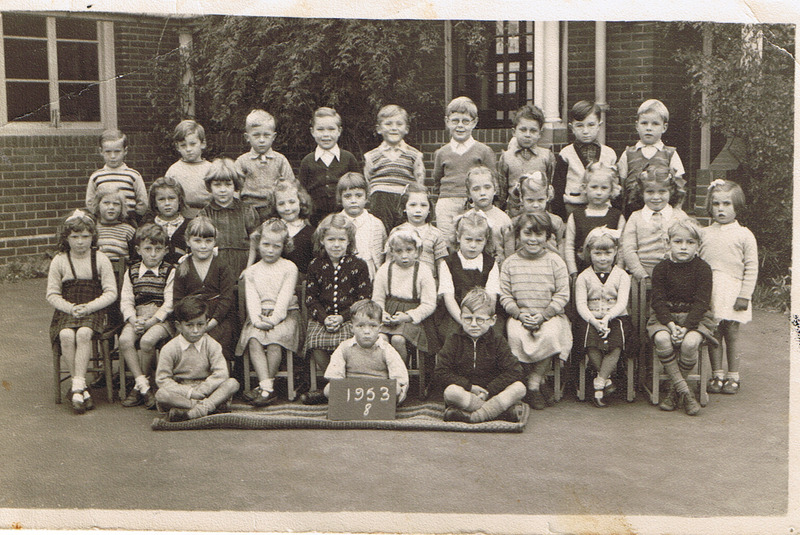 That is me on the right front row seated, also my wife Beryl (Brakes) Brown on the left end of the second row. Front row: seated 3rd from right Shirley Bradford: I think left side seated is David Ward? If you recognise yourself, or anyone else, please leave a comment below. Many apologies for not recognising some of you. Click on the photograph to open a larger image in a new window. Hi John, Beryl. Lovely photo John. Wasn’t Beryl a cutie with her chubby cheeks? Hope we all meet up at the reunion in the summer. Anybody got any pics or memories of the school in the 60’s. I was at the infants and juniors from 1964-1968. I remember Miss Cook was the Headmistress and Miss Dean was one of my teachers. Caroline Barrett was my girlfriend. The boys and girls had separate ends of the playground.There was a line that you weren’t allowed to cross. In the Juniors there was a Headmaster called MacDonald,who walked like a duck, and had various songs about him. I also remember a teacher called Pam Skeites who I thought was really cool as she came in on a scooter and had her name on the crash helmet. There was a massive climbing frame in the playground which was ultra dangerous and eventually got removed. We played football with stones or cans as balls weren’t allowed,and I remember Jean Coulson as a dinner-lady. I went to Whitehawk Junior School from about 1960. I remember a fearsome teacher called Miss New who would shout at us and frighten all the timid children. Thankfully, she was not my class teacher, but she did teach Needlework to the girls. When my pathetic and grubby attempts to sew anything was taken for her to inspect, she would look at it in disgust and throw it across the classroom, demanding that I unpick it and start again. I still hate needlework. Our headmaster was Mr. Taylor who had a white shock of hair and seemed very old. I also remember Mr. Kibblewhite who taught us Maths. He used to send a child out to the shops to buy his cigarettes. I did not enjoy my time at Whitehawk Juniors, but when I went on the the Girls’ Secondary Modern as it was in the days when only the charmed few went to grammar school (yes, you know who you are), I was in heaven. I would like to see some entries on this website about Whitehawk Girls’ School. Anyone out there interested? Hi there, I remember I went up to Whitehawk Sec Girls School age 11 in 1961, also to Junior as well as Infants. Remember all that you mentioned, how strange Miss New was a doll to me, very kind, mind I was a handful. I loved those years as they were so much fun, the hall at assembly with all those hymms, I loved singing. The climbing frame, you’re right, dangerous but so tempting to climb, and the little water fountain at the side of the playground, you had to queue up for a drink. Happy times. I went to Whitehawk school from 1951-1961. Havent got any photos but its great looking at these. Anyone out there remember me? I lived in Hervey road. Maureen (nee Muzzall). I used to live at 9 Hervey Road about 1960 until I moved up to Manor Hill a few years later. My near neighbours were Mrs Gunn and Mrs Goble across the road, and a family called Pither who lived up the road a few doors. Just about everyone went to Whitehawk schools (no travelling out of your neighbourhood in those days) and none of us had the effrontery to think we could go to grammar school, which was a bit posh. My Nan and Grandad Iness lived at 9 Hervey Road with my Aunt Flo and Uncle Roy. My family migrated to Australia in 1956 and I believe Nan and Grandad passed away from old age in the late fifties or mid sixties. I remember the old house well, Nan used to sit near the front window in her lounge chair and wait for Grandad (Old Bill Iness) who was a nightwatchman at the various roadworks, to come home from work. The house was always dark with thick curtains to keep the cold out. The back garden was unkempt with mint growing everywhere, we used to go up in the wilds to pick it for mint sauce with our Sunday dinner. Ooh, I can smell the roast and mint right now. I used to go to the sports field with the Building School and play Rugby Union, and Uncle Roy who was in the Air Force used to come and watch if he was home on leave. Aunt Flo used to manage a restaurant in London but she gave it up to care for Nan and Grandad. I think after they died she worked as a night nurse. I always think of Whitehawk as being wild and woolly, and very cold. Still have good memories of Hervey Road and another generation passed on. Whitehawk Senior Girls School. As newies in the first year we had to attend an assembly, our first one, and there was a rememberance service for a girl who slipped on those horrid marble steps and died. Always stuck in my mind. We had great freedom there and I even stayed on to the sixth form. They were strict, Miss Evans was the headteacher, but being a handful we always had fun. Miss Bloomfield, the Art teacher, eccentric to say the least. Miss Green the Cookery teacher, she caught us puffing ciggies in class. Needless to say we did turn out to all be normal citizens in the end. A great life experience Whitehawk. Hi, I lived at 32 Hervey Road. I remember the Vidlers Tony and Christine and the Cusacks. June was in my year at school but sadly died very young. I also rememebr the Stanbridges and the Martins. My grandmother Sarah Cook lived in Hervey Rd, I think in no. 15. I lived in Wiston close at the time. I would often walk up the steps from the school to visit her. I remember having big christmas lunches at her place. Does anyone remember the Cook family? I remember the Cusack family as my family lived across the road from them. My mum and dad, June and George Sullivan, were friendly with the Cusacks and used to go to their house for parties at Christmas and New Year. I used to walk to school with Christine Vidler, as we were in the same class. Did you go to Whitehawk Senior School? My parents were Vic and Lilian Cox and we lived on the right hand side of Hervey Road going up from The Broadway. My nan, aunt and uncle lived at 44 Whitehawk Crescent – they were the Hylands. My cousin John Streeter lived at 4 Manor Hill. Does anyone remember them? We lived at 37 Hervey Road. I remember the Vidlers and the Martins-our neighbours were the Halls and the Fosters. We all went to Whitehawk School together with my sister Marion and my brother Ray. Wow! What a lot of wonderful memories, I was born at 3 Hervey Road, mum and dad Don and Irene Gander, Alf and Kit Gander were my grandparents. Some of you may recall our Boxer Dog that we had too? I have one brother Keith Gander. I believe my Nans very dear friend was Flo Iness from Hervey Road and I remember Roy well in my childhood. The neighbours were Jim and Ellie Leishman, he was a postman. The Stapletons at no.5 then David and Susan Smart, David tragically died in 1971. I am still in contact with Maureen, Gwen and Pat Stephenson, also Elaine Underhill, was Bradley. So many names come flooding back when you start thinking. I still get a kiss and a hug from Mary Holter, her husband Len was our milkman, sadly he has passed away, but he always let my brother ride on his milk float and do his round with him. My Mum’s maiden name was Woollard she had brothers Peter, Anthony and a sister Janet, they grew up at 30 Fletching Road, opposite the Mountfords. Oh how I wish my kids could have grown up in the community that I did, we always felt safe, even playing in the street till it was dark was not a worry in them days. After Hervey Road we moved to Piltdown Road, neighbours were Family Smeatons, Angela and Will Parker, Harris, Newlands, Bonds, Hemsleys and Plants to name but a few! I still go to visit friends and family in Whitehawk and have watched my grandson play football up on the pitches for The Hawks many times. I am currently introducing my grandson to the French Skipping, he is amazed what fun can be had with a bag of elastic bands! Lol keep the memories coming please, you are all great! By Karen Haughton nee Gander. I have this photo at home! I am in the second row, fourth from the right, next to Elaine Diplock. Seems like yesterday! Hi all I and my brothers Barry, Bob and sister Barbara Chapman all lived at 100 Hervey Road opposite Jenny Blunt and Alan Blunt. Next door to us were the Gunns, Janet and Rodney I wonder what happened to them? Other side of us were the Barons Vanessa and Veronica, then the Cowdrays, and then the Balls, Susan was her name. I used to love bonfire night when we would buy coloured matches from the shop on the Broadway and light them and throw them in the air. No health and safety then thank God! Happy days! I remember Mr Kibblewhite very well “My home town of Steyning” and of course his beloved Brighton and Hove Albion! He used to call me “the little professor” as I was so bad at mental arithmetic! Malcome Sturgess was the brainy one I remember. Carol Waite, Linda Saunders all come to mind. There was Mr Kipling, Miss French, Miss Tavender Miss Tampkin, Mt Stockbridge, Miss New Mr French? and of course Mr V.A.A. Taylor the Headmaster. Miss those carefree days! Hi Christine, I just read your post, the Blunts are relatives of mine. Alan and Jenny still live in Brighton, although I haven’t seen them for years as I live in Canada. My mum was Alan and Jenny’s sister, there were other older sisters and an older brother as well. Does anyone remember the Blunt family? Does anyone remember the Durrants who owned the Fish and Chip shop in Manor Hill? My Mum and Dad had the shop from 1952 until 1981. We all went to Whitehawk Infants and Junior – but we all moved on to all over the world. I remember Miss Coo. She was a most fantastic headmistress. I can remember going back to the school when I had a Xmas post job as a student. Miss Coo remembered me and my brothers – that was going back 15 years. A good school. My family lived at 128 Whitehawk Avenue. My sister is June and my brother is Keith. We all went to the three schools. When I was 15 we moved to 71 Whitehawk Avenue. I remember Miss Coo at the infants school. I also remember my very first day. Is there anyone who remembers us? Back row, far right is I believe, Peter Adams. Hi I lived at 88 Hervey Rd went to all three schools would love to hear from any one that knew me in the good old days.